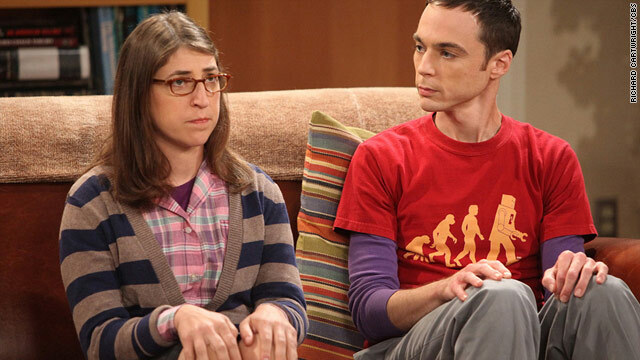 Mayim Bialik plays Amy Farrah Fowler on the CBS hit comedy "The Big Bang Theory." Mayim Bialik plays Amy Farrah Fowler on "The Big Bang Theory"
(CNN) -- You may remember her as the title character from NBC's "Blossom," or recognize her as brainy Amy Farrah Fowler on the CBS hit comedy "The Big Bang Theory." Mayim Bialik has made a name for herself in the entertainment business, but she's also had a lesser-known career in a similar field as her "Big Bang Theory" character: neuroscience. Bialik, 35, who will attend her first San Diego Comic-Con next week, studied neuroscience at the University of California, Los Angeles. She's also written a book about parenting based on the science of hormones involved in parent-child bonding, to be released by Simon & Schuster in 2012. "Not that you need a neuroscience degree to be a good parent... but my reflections on parenting are absolutely informed by my understanding of the hormones of attachment, which were the subject of my thesis," she said. The daughter of teachers and the granddaughter of European immigrants, Bialik was studious as a teenager and always knew she wanted to go to college, even while on "Blossom." "I basically walked off the television and onto the UCLA campus," she said. She earned an undergraduate degree in neuroscience and Hebrew and Jewish studies before moving on to advanced studies. Frat guys would make silly comments sometimes because of her former TV life, but generally her science classmates seemed to mostly keep their noses in their books. "I had to earn my way through based on my intellect and my brainpower," she said. Her Ph.D. research at UCLA focused on obsessive compulsive disorder among people with Prader-Willi syndrome, a rare condition in which the hypothalamus malfunctions. The hypothalamus secretes the hormones oxytocin and vasopressin. Her research on these hormones, which are critical to the mother-child bond, helped her understand biological mechanisms involved in parenting. For instance, while some mothers complain about having to breastfeed their infants about every two hours all night, Bialik appreciates a deeper significance. The hormones that make a mom feel closer to her child get refreshed during breastfeeding. So if babies want milk every two hours, that guarantees a frequent rush of hormones that bond mother and child. Breastfeeding, sleeping close to your baby and keeping him or her close to you as much as you can are all part of the natural human process, she says. Bialik is also an advocate of "gentle discipline," or not using physical force against children. "We're starting to see more and more research substantiating that children hurt when you hurt them," she said. Bialik had originally intended to become a research professor, but she and her husband decided that academic life wouldn't allow them to spend as much time with their children. For their two sons -- "an almost-6-year-old and an almost-3-year-old" -- she and her husband don't use nannies, babysitters or daycare, and don't even rely on family members to look after their children. Bialik's husband stays at home when she's working, which is about every other week. And they're considering continuing to homeschool their children. There's a large homeschool community in their area of Los Angeles, so it's not necessarily an isolating experience. There are opportunities to have a structured curriculum with other homeschooled children, she said. The flexibility of the schedule of homeschooling, and the opportunity to spend time with their children for most of their day, appeal to Bialik and her husband. So does the independence from standardized testing. "Especially with our kids who are 'late bloomers,' we're happy to watch them develop at their own pace," she said. "We like to know what they're learning and how." As if it's not enough to be a mom and an actress on a popular sitcom, Bialik designed a neuroscience curriculum for homeschooled middle-schoolers. She taught 10 lucky kids all about the brain two years ago -- everything from the the brain's structure to the spinal cord to how the senses work, in addition to the ideas of the "early heavy hitters" of neuropsychology like Sigmund Freud and Ivan Pavlov. "I think neuroscience is obviously very esoteric, but I think there are aspects of it that absolutely be brought down to the level of an interested 11-, 12-, 13-year-old easily." This past year, she taught biology and chemistry to three different classes in the homeschool community for elementary and middle school students. Sometimes writers and producers on "The Big Bang Theory" ask Bialik questions related to her character's neuroscience background, although the show also has a physics consultant who provides notes on scientific accuracy, too. "I don't think I've met a smarter group of people who hang out together, possibly ever, even in graduate school, than our writers and producers," she said. Although many fans are looking forward to seeing Bialik at Comic-Con, she's nervous about the experience. "I'm a pretty quiet person. I think it's going to be a lot of people. But I think it will be fun. I'm glad to be able to go with the cast. I'm friendly with the people that I work with, which is nice, so we get to do it together."